Three DP70 (870+892+896). DP70 892 & 896 sold late 2007 to a Private Collector in Norfolk, currently being restored and future use in a Private Cinema Museum complete with working Cinema Organs late 2009. Opened November 2004 for 35mm and 70mm. Machines from Metro (Aston-Under-Lyne) September 2004. 1405 and 1397 are main projectors; 872 has half of the parts missing, and will be used for spares; 868 has virtually all the parts gone, but we have it just in case. 872 & 868 are the mech heads only. 5th from MOMI (London) - unfortunately the serial number is missing. Projector 1 is 1405, and Projector 2 is 1397. At the Metro, Ashton, they were the other way around. As they were using a tower, they had used 1397 for a much longer time, and now the Rex use 1405 most of the time with the same tower. So in about 5 years' time, they should have evened themselves out, and had about the same amount of use each! The DP70s are running very well, although the picture is not quite as steady as a new projector would be. I am ordering some new gate pressure bands for 35 and 70mm, so this might improve the picture. 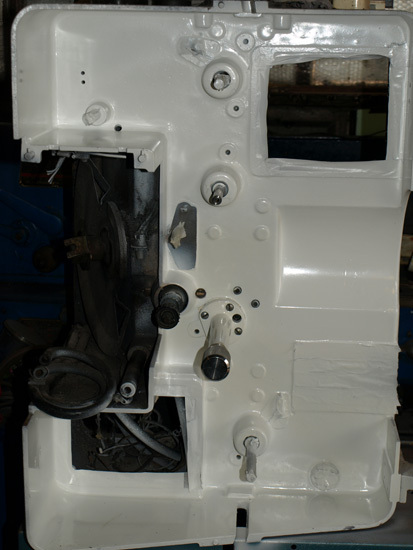 We completely rewired the machines and we sent the original motors away and had them rewound as 3-phase 230 volt, with inverter drive; they are very smooth now. 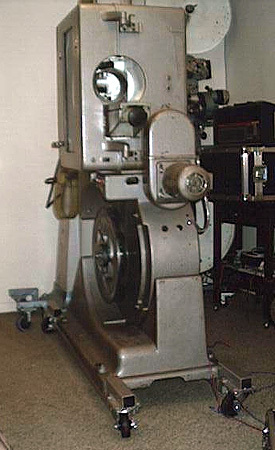 The installation is capable of running 35mm with 1.37, 1.66, 1.85 and 2.35 ratios, and all 70mm formats. We have installed the Panastereo CSP4600 70mm processor for this. Ed Mauger (20.06.2005). Two DP70 from ABC Bristol Road (Birmingham). 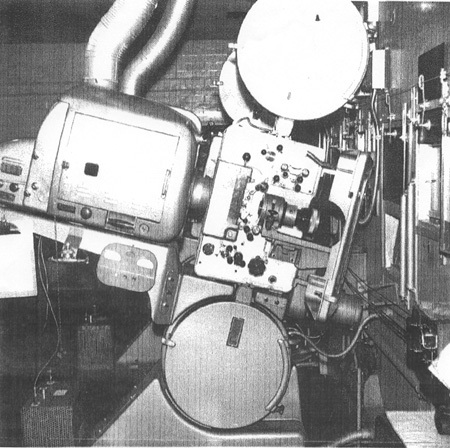 Installed for the 1964/5 Midlands Premiere of Warner's 70mm production "My Fair Lady". Several other 70mm films opened at ABC Coleshill St prior to this. "Cheyenne Autumn", and "Becket". A European "Western" was also played in 70mm, it's name escapes me, as apart from the stunning 70mm photography, it had very little to commend it. DP70s moved to the new ABC DONCASTER for its opening. At which time the "important official" at this new cinemas opening ceromony, "congratulated the ABC company for its faith in the future of the cinema busines through installing the latest projection equipement." 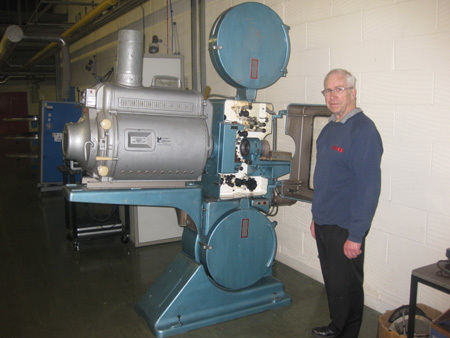 John Duddy Chief Projectionist (Retd) ABC Coleshill St Birmingham 1958 --1969. Two DP70. 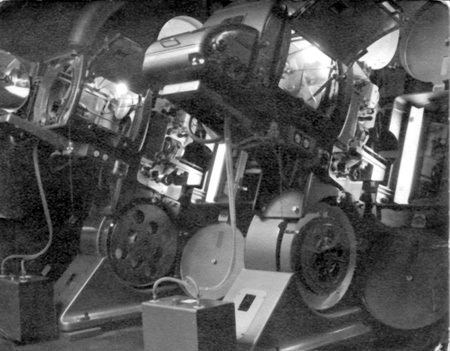 3-strip Cinerama from 14.09.1963 on 78 x 28 ft screen from single box. Multi from 1978 and demolished 1988. Now a drive-in McDonalds. 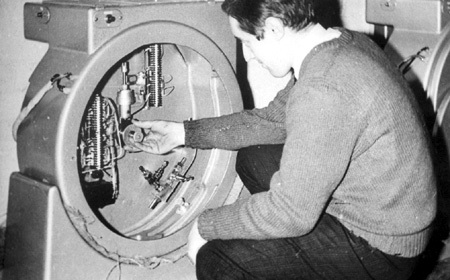 Machines moved to ABC Coleshill Street around 1964. 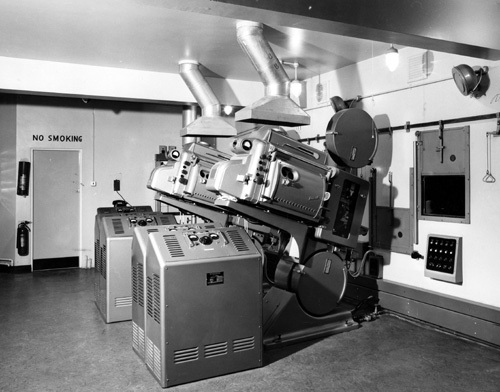 DP70 installed for "South Pacific" 22.09.1958. Ran 67+ weeks. Opened 12.12.1912. 900 seats. Taken over 10.04.1929 re-modled 1770 seats. Renamed ABC (North Shore) 1960. 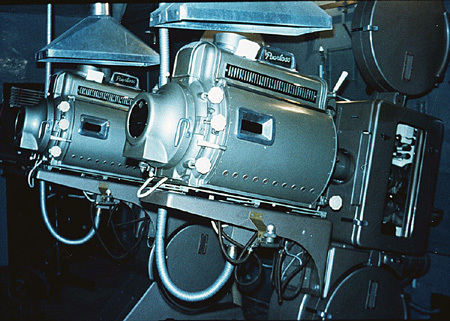 Originally DP70 projectors were meant for ABC Hippodrome. Renamed ABC Princess 1963. Closed 1981. Now indoor market. Two DP70 from late fifties. Cinema closed. 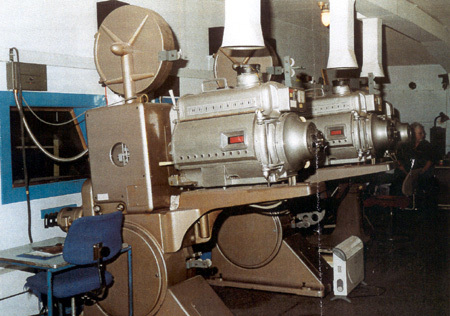 Resent (1992) recovery of this theatre projectors revealed rusting Victoria X's. Now a bingo. Two DP70 (1622+1915) 1622 from Imperial Bio, Copenhagen, Denmark. Imported in November 1998. First performance was "2001: A Space Odyssey" March 15, 2002 for the Wide Screen Weekend. Equipped with a D-150 lens. 1915 from Plaza #1, London - in storage. Opened 21.12.1933. 1823 seats. Reconstructed and reopened 02.08.1958 for "South Pacific". 4th Todd-AO installation in England. 1st with Philips sound. Closed 1977. Now a bingo. Two DP70. Opened with "Doctor Zhivago". I may be wrong but I don't think the ABC Whiteladies Rd. ever had 70mm. It was at the New Bristol Centre which was the ABC roadshow house for the region. 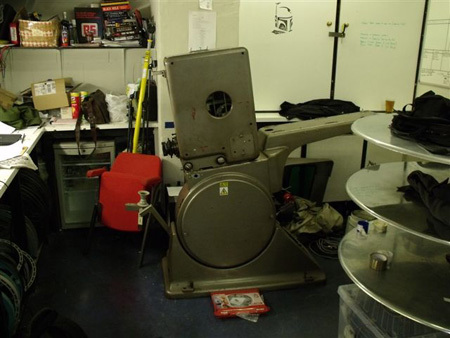 Hi, Just came across this page which as an ex projectionist I found fascinating. 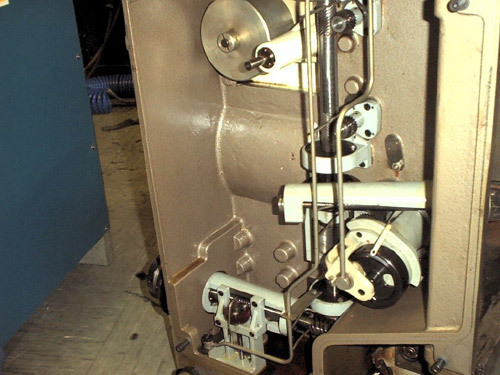 I'm afraid I only handled 70mm briefly when I just after I started my first job, I was sent for two weeks training at the Manchester Film under Don Sykes, and then it was back to 35mm at the Bristol Arts Centre (Kalee 21s with Autoarcs). Where we still showed the occasional "Nitrate" film well into the early 1970s. One small correction to the comment about the Bristol ABC White Ladies Road. 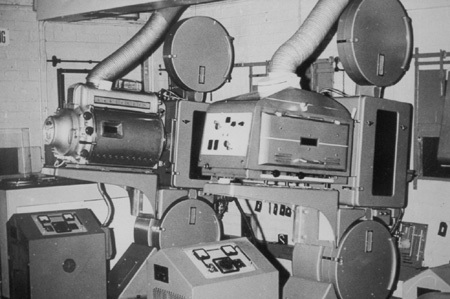 Some time before the ABC Cinema in the New Bristol Centre opened, the Whiteladies cinema was in fact remodelled with a deep curved screen for 70mm presentations, and I remember going to see "Ben Hur" there in "Camera 65" when it was first released. I was once told that the DP70s in the New Bristol Centre originally came from the Whiteladies, but don't know if that's really true. "South Pacific" from 26.12.1958. DP70 taken out and stored in a garage (Unconfirmed). Machines sold for 50 pounds as scrap. Cine Aperagons to Thomas Hauerslev, Copenhagen, Denmark March 1998. One DP70 (841) from ABC Luton. Moved to ______ in late 2003. "South Pacific" from 26.12.1958. Demolished late 70's. Now a mall. Opened November 1935. 2047 seats. Closed 03.04.1976 for tripling. Reopened 27.05.1976. Renamed MGM 29.05.1992. Two DP70. Theatre closed and demolished. DP70 fate unknown. Two DP70 (1810+1811). Two former Technicolor DP70's from Ben Wales. May be installed in a Art Deco Cinema sometime in the future. Two DP70 from ABC Coleshill Street (Birmingham). One DP70 (1391) from Dolby Laboratories. Originally it came from Portmouth Odeon. 4 DP70 in store by 1988. Never used. Exported to a gentleman in Germany. One DP70 (1352) from Empire, Leicester Sq. Unused since 2006 for public screenings. Image by Darren Briggs June 2010. Two DP70 from around 01.02.1960. 59 x 27½ ft screen. The 19th CMA cinema with DP70. Opened 26.01.1934. 2553 seats. taken over by ABC 08.11.1937. 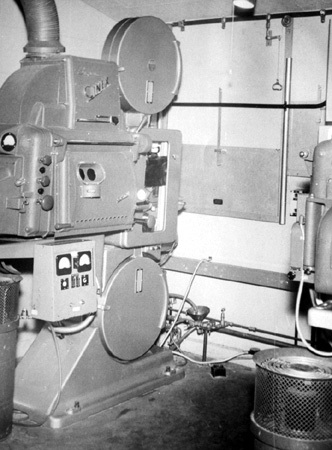 Renamed ABC for "South Pacific" and DP70 install 21.02.1960. Closed 31.07.1976 for quinrupling. Re-opened 21.10.1976 renamed Cannon. Closed 29.06.1989. Opened 19.11.1934 1950 seats. Renamed ABC 23.05.1959. Closed 19.07.1969 for twinning. Reopened 04.04.1970. Renamed MGM 21.05.1993. Opened 26.06.1937 2424 seats. 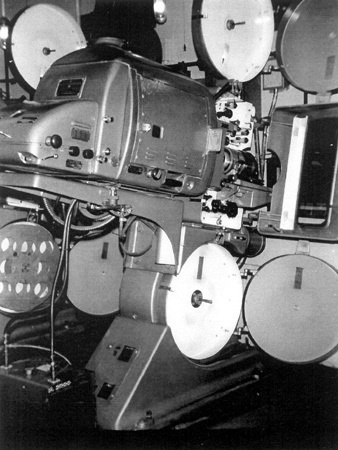 DP70 installed 1959 for "South Pacific". Renamed ABC 1960. Closed 24.01.1970 for twinning. Renamed Cannon. Opened 16.09.1912. 1029 seats. Taken over by FOX 1954. Taken over by ABC 04.04.1960 and reopened 10.07.1960 with Todd-AO installation, 870 seats and 36½ x 16½ ft screen. Closed 17.07.1982. DP70 junked. I have just read your DP70’s in England and your article regarding the Futurist Liverpool’s destination of the DP70’s is incorrect. Both machines where removed sometime after it closed and they were sold to the Metro in Aston-Under-Lyne. The ABC Forum opened up after conversion to a triple with DP75’s. 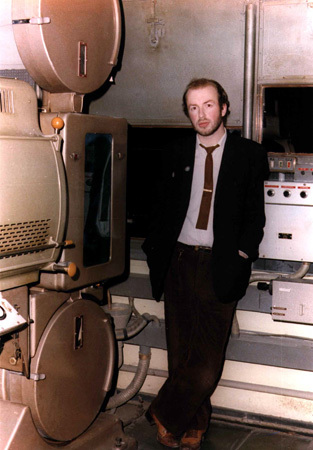 The reason why I know is I was the Chief Projectionist at the Futurist when it closed and I was asked back after it closed to assist in the removal of the projectors. I ran the show the first night of opening at the Metro with the DP70’s. 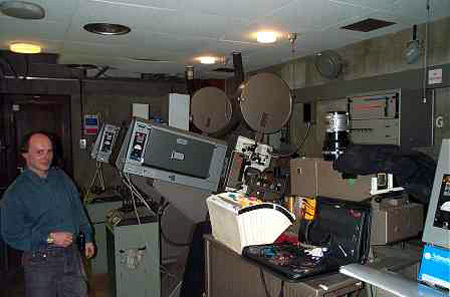 The remaining equipment from the Futurist was used at the Forum i.e. speakers non-rewind Phillips OMA amps etc. 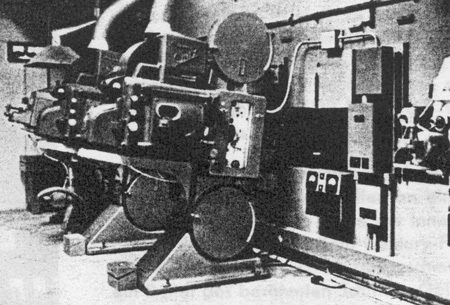 The Dolby CP50 was also taken over but was blown up during the installation by the Sound installation team and was naturally replaced. Hope that clears up any misunderstandings. 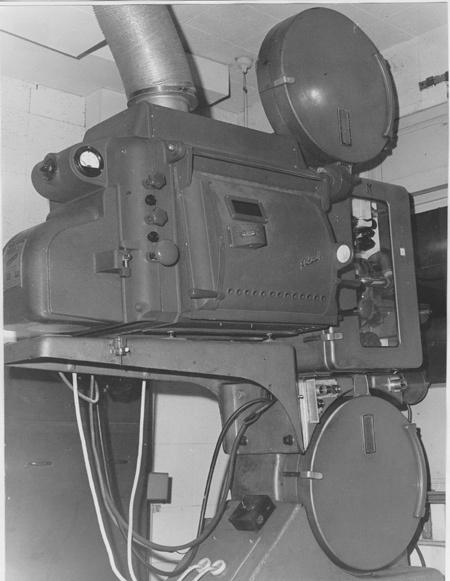 DP70 installed for "South Pacific" 26.12.1958. DP70 moved across the road to Gaumont during twinning. Reinstalled in the Odeon late 60s early 70s after twining was complete. They were removed from the Odeon 1976-77. The last DP70 sent to MOMI, London for spares. Opened 1927. "Around the World in 80 Days" opened Thuesday 09.07.1957 in Cinestage using a special 35mm reduction print with 2,21:1 aspect ratio and 6-track magnetic stereo on seperate film. Ran for two years. 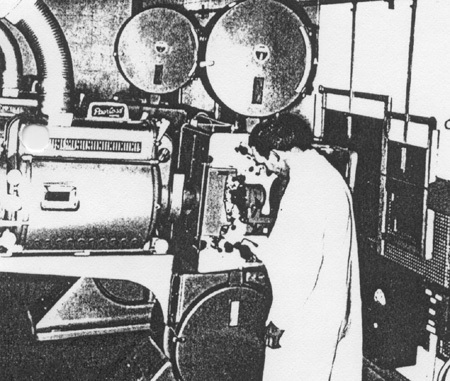 Due to "British Quota" regulations one millimeter of the film was removed creating a 34mm substandard print. 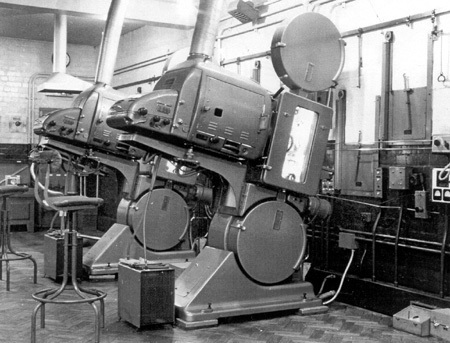 DP70 installed for "Sleeping Beauty" 29.07.1959. Opened again 17.12.1968 with "Around the World in 80 Days" in 70mm. DP70 removed and Victoria 8 installed at some point. Cinema closed 1976 and is now used as a rock venue. Awaiting demolition. Two DP70 (2170+2171) from December 2018. Imported from Orla Nielsen, Denmark. The first 70mm film was "The Fall of the Roman Empire" during Easter 1965 at the originally instal at the Folketeater in Århus, Denmark. Two DP70. DP70 at the Casino. The first 3-strip Cinerama theatre outside USA. 3-strip from 30.09.1954 until 26.03.1965. 70mm from 08.04.1965. 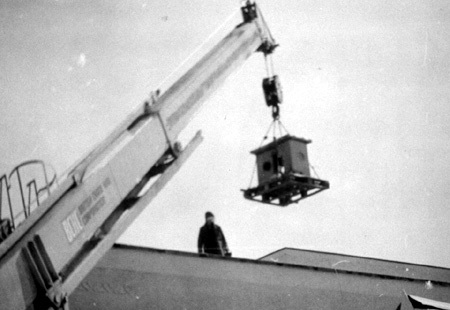 70mm, DP70 and Cinerama screen (63 x 23 ft) removed 19.09.1974. Cinema converted to original Prince Edward Theatre. Two DP70 ( +838). Opened 03.02.1959. Screen was 10,5 x 5 meters. Last DP70 removed mid October 1992. Now two Philips FP20. Cinema renamed Curzon West End. 624 seats. 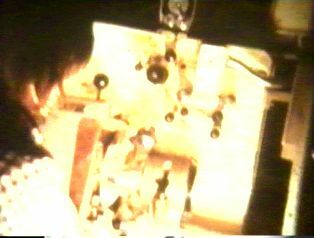 DP70 sold to Film Institute of Ireland summer 1998. One DP70 (Maybe two DP70). Coronet, Turnpike Parade, Green Lanes, London N15. Formerly known as Ritz, ABC, & Cannon. This cinema has been tripled. The old sound equipment was still there Feb 1999. One DP70 (1391). Office closed and activeties moved to Wootton Basset 1993. DP70 to private in Essex. First Todd-AO installation in the UK. Opened 21.04.1958 with "South Pacific". Screen was 46 x 21 ft with 5ft depth. Played more than 4 years using at least two 70mm prints. One print shown more than 1382 times. Special downstairs box in the rear stalls for Todd-AO. Theatre later used for live performances. Victoria 8 present 1985, original DP70 lost. Two DP70 may be installed, however, not the originals. Three DP70 (1349+1352+2125). 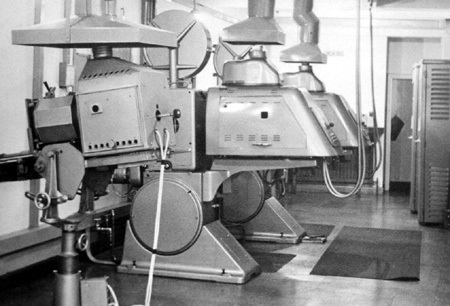 Installed for "Ben Hur" 16.12.1959 with Ascraft carbon arc. 53ft x 29ft (17,7 m x 7,9 m) curved Todd-AO screen, THX, CP200, JBL. Dolby Stereo Digital (SR.D). 1330 seats. DP70 1349 removed 1995, but still on site used for spares, and replaced by one FP30. DTS. DP70 1352 unused since 2006 for public screenings - removed, and installed at Picturehouse Cinema Greenwich. 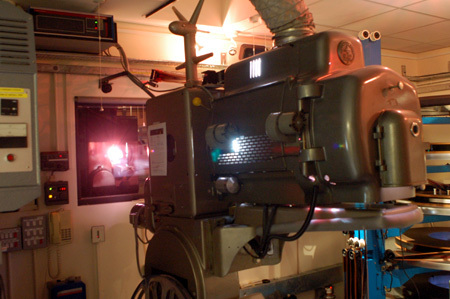 DP70 2125 removed and dismantled in November 2008 as space is required for a 2nd 2k 3D Digital Projector, future plans to display this projector in the Cinema Foyer. Two DP70 (901+902) from Drake, Plymouth. Any frame rate from 15 -30 fps could be shown. MOMI closed summer 1999. 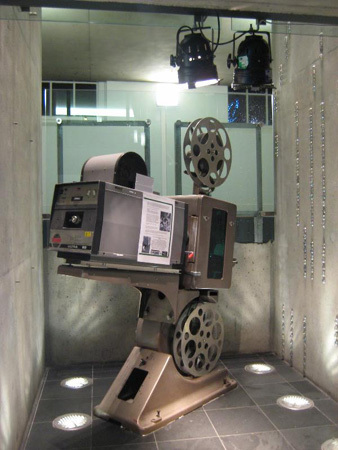 2 projectors from MOMI in London were sold to the Kinopolis group in Belgium about a year after it closed. Also one spare projector head for parts from Odeon, Liverpool, which went to the Rex (Berkhamsted) - unfortunately the serial number is missing. 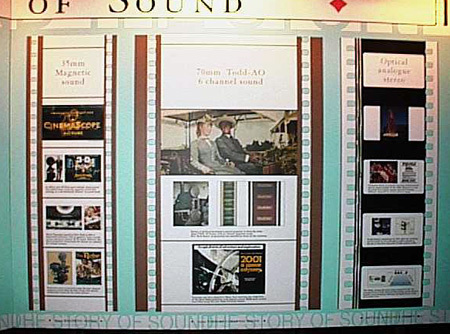 A few weeks before closure in 1999, Dion Hanson had this display about movie sound prepared. One DP70. Frobisher Road, London N8. Formerly known as Premier Electric Theatre, Regal, Essoldo, & Curzon. This has two projectors but only one of these is a DP70. Refurbished in 1998, having been out of use as a cinema since 1989. Two DP70 very rarely used. 1100 seats. Philips SPP light. 6-track magnetic stereo and Dolby A for 35mm. Screen size (CinemaScope): 9,75 x 4,1 metres. 1810 & 1811 dismantled & removed on 23/12/08 as Theatre was closed down - both DP70's are in storage with Ben Wales in Southampton. Technicolor Ltd (West Drayton) London site to close on January 2009 and relocate to Pinewood Studios. Two DP70 (2505+2509). DP70 2505 & 2509 removed and dismantled in 2004 and may be in storage (unconfirmed) on site. Technicolor Ltd (West Drayton) London site to close on January 2009 and relocate to Pinewood Studios. 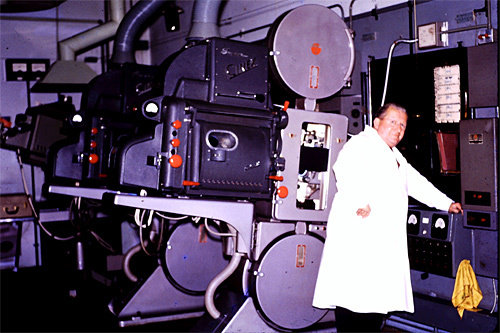 Two DP70 in third screening theatre to check release print quality (internal use only). Theatre closed. 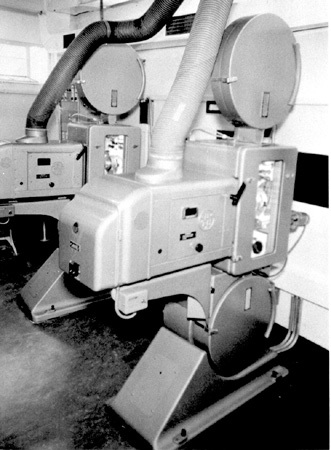 Projectors used for parts in #1 & #2. Rest was scrapped. Three DP70. Opened 1938. 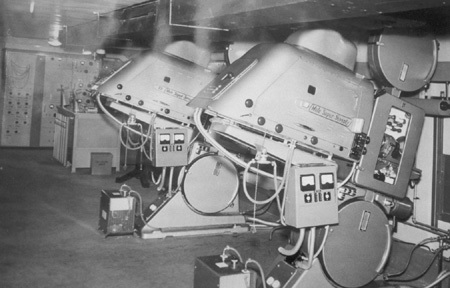 Rebuilt and reopened in 23.07.1964 with DP70 projectors for "My Fair Lady" (opened New Year 1964/65). 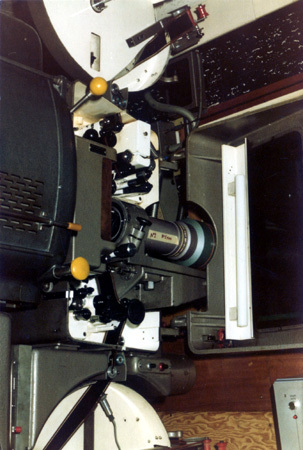 70mm screen width: 46 feet and 6 inches. Depth: 6 feet. Demolished 91. New Warner 7 plex built on site. Two DP70 (841+___) 841 to Thomas Degg, Stoke on Trent, England. Two DP70. Not a matched pair. Opened January 1914. 870 seats. Closed for reconstruction 18.10.1930 and reopened 17.11.1930. Taken over by ABC 05.07.1959. Closed for modernisation and Todd-AO installation. Reopened 04.09.1960 697 seats. Renamed ABC 1961. DP70 taken out 1982. Belived sent to America. Closed 09.08.1990. Screen 38 x 17 " 3`. 2nd Todd-AO installation in the UK with "South Pacific" in Todd-AO from 29.04.1958. "South Pacific" ran two years and 6 weeks completing 1248 runs. Originally Hippodrome Theatre. Theatre closed 1973 and demolished. 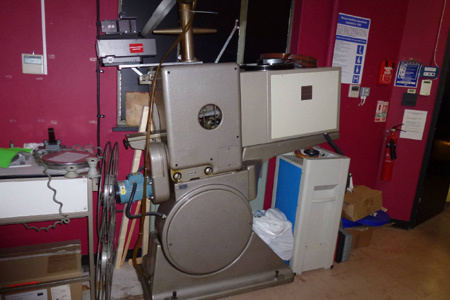 DP70 sent to Odeon, Middlesbrough for spares. Hi Thomas , I found this picture on Flicker on a stream of almost 5000 photos by someone called "dusashenka". Its said to be the Elite Middlesborough taken on 27th november 1964, that's the only info given. Four DP70. Two originals and two from Gaumont for spares. All 4 DP70 scrapped 1989. Two DP70 (892+896) from Odeon, Hanley in October 1964. Ran "South Pacific" from 22.09.1958. Renamed Queens Cinerama Theatre from October 1964. 3-strip Cinerama 1963-1978. Todd-AO on 73 ft x 31 ft screen with 90 ft throw. Arclamps: Super Zenith 130 amp, 48 volts. 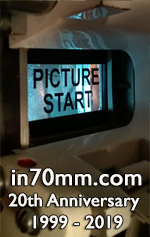 Last 70mm film was "Star Wars". Closed February 1980 and demolished 1983. Now a mall. Machines with Steven Keenan. One DP70 from ABC Sheffield. Opened 16.10.1939 with 2077 seats. renamed ABC 14.12.1959. 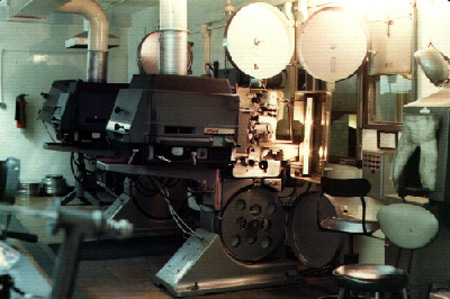 Two DP70 taken out 1974 when converted to three screens. Carlton became EMI, Thorn, Cannon, Pathé and now MGM 21.05.1993. Opened 20.04.1936 1654 seats. 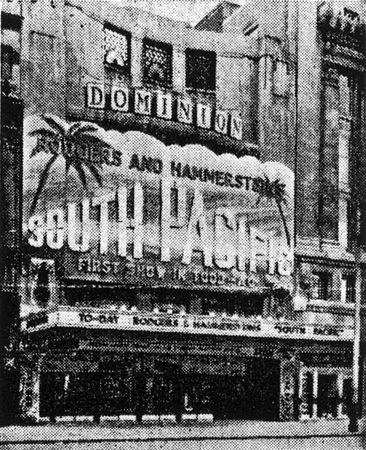 70mm installed 1959 for "South Pacific". Renamed ABC 1962. Closed March 1963 by fire, reopened September 1963. DP70 removed 1975 when Ritz was tripled. Renamed Cannon and again MGM 09.04.1993. Three DP70 (870+892+896). I have recently purchased a pair of Philips DP70 projectors from my friend Steve Keenan (Barry South Wales/Shropshire) so I thought I would provide my details for you to update your DP70 records, Model numbers: 892 (complete) and 896 (complete) 870 (parts only). The projectors are currently dismantled and awaiting installation in my home cinema which is being created in a converted barn. It should seat about 100 people and will also have a mighty Wurlitzer organ to complete the 1930s feel. I am just putting the finishing touches to the organ chamber which will form the auditorium front. The screen frame will be erected across the central area and the proscenium will extend either side over the organ grilles to accommodate the curtains. The screen will be 5 meters wide and about 3 meters high. There is still a lot of construction work to do but the projection room and film store are the next priority. As you can see there is not a lot of space to move in yet but this will improve once I start installing the organ. Best wishes, Anthony Storey, February 06, 2009. Two DP70 (901+902) in 1959. 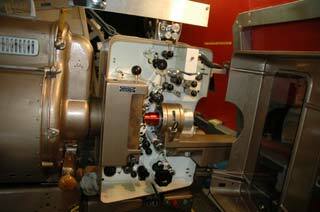 3rd DP70 installation in England (after Dominion in London and Gaumont Theatre in Manchester). 1650 seats, 18,3 m screen with 2,4 m depth (with adjustable screen curvature). Ashcraft Super Cinex lamphouses. DP70 taken out late 70s and stored at cinema. Removed and sent to MOMI in London. The Drake closed October 31, 1999. 70mm lenses and oak box of 793 to Thomas Hauerslev, Copenhagen, Denmark. 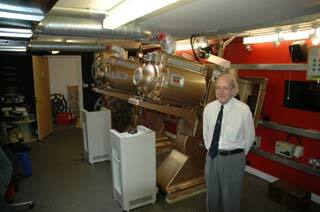 My father was the chief Projectionist at the Drake Cinema in Plymouth when it opened in 1958. We had moved from Essex (on the Steam Driven Cornish Rivera Express) for him to take up the job, having previously worked at the Plaza, Leicester Sq. London for a number of years after his demob from the Royal Australian Air force after WWII. 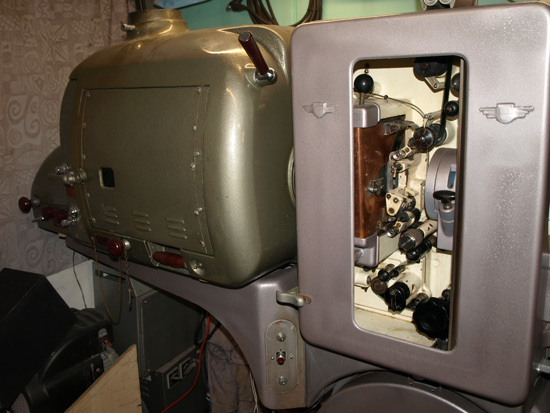 I remember the many visits I made to the cinema with my father to the projectionist box and would spend many hours watching some of the films that was shown from the little window next to the projector. Two DP70. Opened 18.05.1961, 1327 seats. 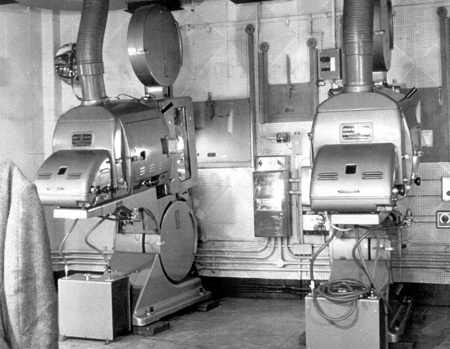 DP70 removed early seventies and acquired by The North West Cinema Preservation Society which installed them privately for 10 years. Renamed Cannon and closed 28.07.1988. Demolished 1992. One DP70 to private in Newport. Two DP70 (645+847). "South Pacific" from 26.12.1958. Cinema demolished. Three DP70. (1913+1810+1811) fra Plaza #2 in London. 1810 & 1811 From Technicolor, London December 2008. 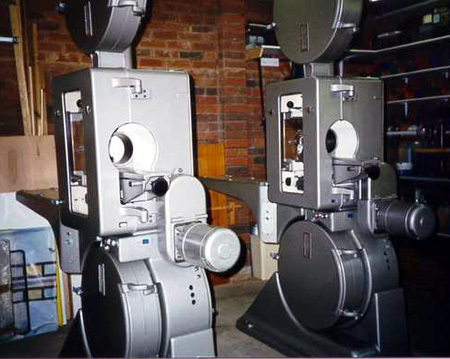 July 2010 update: July 2010 update: Two former Technicolor (Theatre one) DP70's (#1810 & #1811) sold to David Parker in Devon. They may be installed in a Art Deco Cinema sometime in the future I believe. Two DP70 (645+847) from Odeon in Sheffield in immaculate condition. The first 70mm film to be shown here being a re-run of "The Sound of Music". 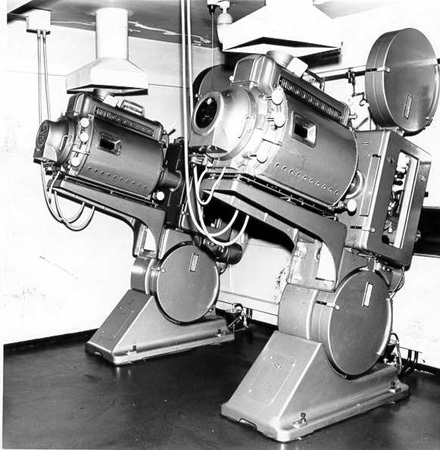 The projectors are now DP75s. 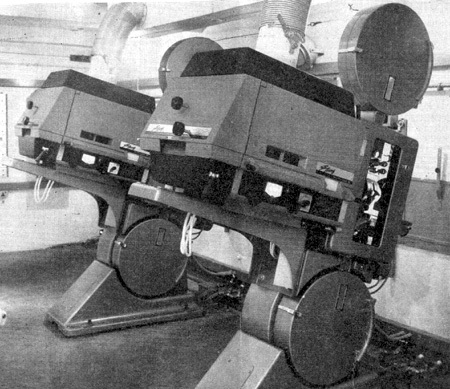 DP70s came from Odeon Sheffield by crane in 1973. Image by Don Sykes. 3 DP70. Originally two was installed. App 1000 seats with Dolby Stereo. Third machine installed in mini theatre. Closed September 1997 and demolished. Two DP70. Opened 23.08.1963. 1348 seats and 60 x 28 ft screen. Closed 28.05.1977 for tripling. Reopened 25.08.1977. Re-named Cannon. Two DP70 (864+869). Machines now with Stephen Rowley. The listing for the Hanley ODEON has '(Gaumont)' after it - this is incorrect. The 892 and 896 were situated at the ODEON on Trinity Street, the Gaumont was situated further in town and is now the Regent Theatre. To clear the naming issue up, the cinema in Hanley was once called The Gaumont as part of a national chain (i forget which chain). Either before or after this the site was bought by ODEON, and so ODEON and Gaumont should not be used together to label the site. As far as i am aware this site did not have a DP70 installation (i will double-check this with Tom). Patrick Brown, Technician ODEON Festival Park Stoke-on-Trent. 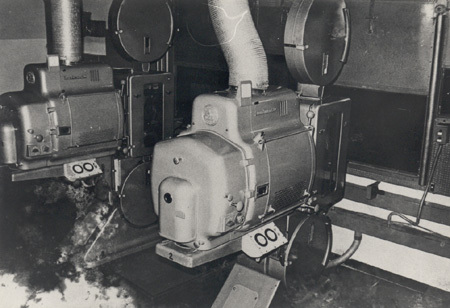 Two DP70 (892+896) installed in July 1959. They both used Mole & richardson Super 409 arc lamps. Their first show was "South Pacific". Tom Degg first used these in November 1962, when he was just 15, and they sparked a love affair with 70mm. The last show for 892 & 896 whilst in Stoke-on-Trent was "Cleopatra". In October 1964 they were sent to The Queens (Cinerama Theatre) in Newcastle-upon-Tyne as part of a Cinerama installation. 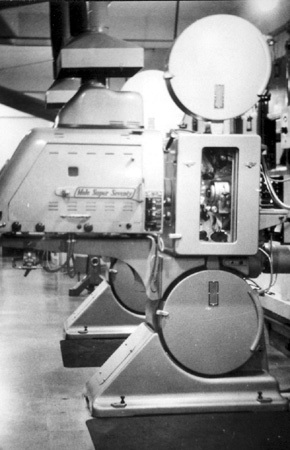 70mm made a return to Trinity Street in 1965 with the installation of two Cinemeccanica Victoria 8's, showing "Those Magnificent Men and Their Flying Machines". 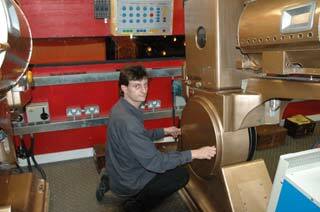 Patrick Brown, Technician ODEON Festival Park Stoke-on-Trent. 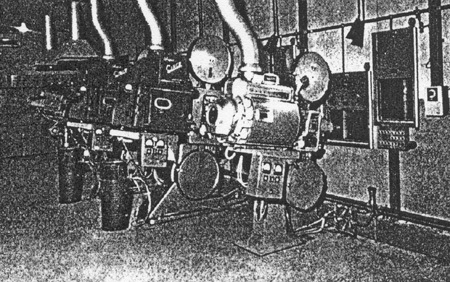 I have a photograph of DP70's 892 & 896 from their days at the ODEON Trinity Street (Stoke-on-Trent). Supplied by our Technical Manager Tom Degg. One DP70 (841). Originally from a cinema in Luton, this was rescued by Tom Degg from a technical school in Burton-on-Trent during the course of it's demolition back in 2005. It is now owned privately by Tom Degg and is in situ alongside ODEON 7 at the Festival Park site. 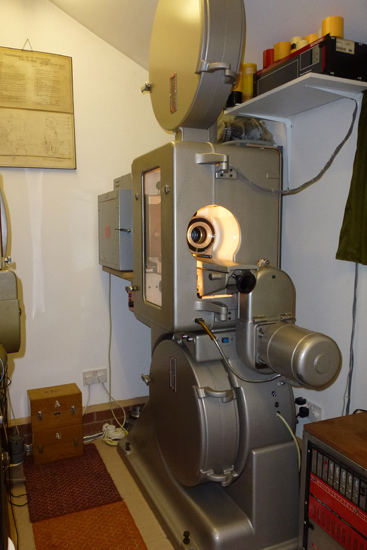 It's presently set up for 70mm presentation and is in full working order, with a 35mm conversion in storage. 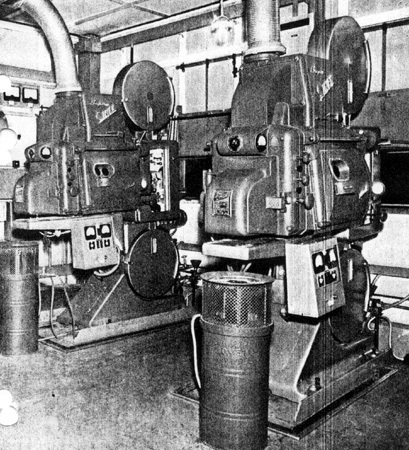 I was a projectionist till 1987, My father (Jack) was a BTH cinema engineer from 1958 till BTH closed it's cinema servicing dept and he was taken on by Westrex, he was made redundant in 1978. We lived in the market town of Altrincham in Cheshire. Dad list of cinemas when he worked for BTH was from an RAF base at Barrow in Furness to the Odeon Hanley Stoke on Trent. 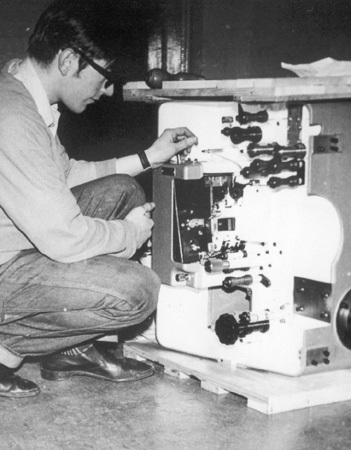 Dad was one of the BTH engineers who installed the DP70's in the Odeon Hanley with the new BTH stereo sound system which looked similar to the Kalee Duosonic in that the amplifiers were in the same style of cabinet. I now have those 2 DP70 and are under going restoration. Three DP70 (859+867+___) in store for later use.